Louis Longridge (left) in action for Hamilton. Raith Rovers have boosted their squad ahead of tomorrow’s league match at home to Alloa with the signing of a young striker on loan from a Premiership club. Following the departure of Jon Daly to Hearts, and the return of Craig Wighton to Dundee, Rovers boss Ray McKinnon has secured the services of Hamilton Accies forward Louis Longridge until the end of the season, and the 24-year-old goes straight into the squad for tomorrow night’s match. Longridge has been a first team regular for Accies this season, making 16 appearances, and featured from the start as recently as the 4-3 defeat to Inverness Caledonian Thistle on December 30. He has scored one goal in the Premiership so far this season, and has netted 15 times in 71 starts for Accies in total. 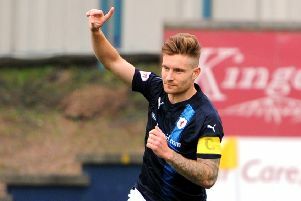 Speaking to Raith TV, boss McKinnon said he was “absolutely delighted” with the capture, adding: “He’s got a great pedigree and has played a lot of games in the Premier League. “He’s young, he’s fit and he’s quick which is the sort of team we were looking to build at the start of the year. McKinnon also confirmed that he is still looking to bring in an additional striker or wide player in the January window.